OMG! 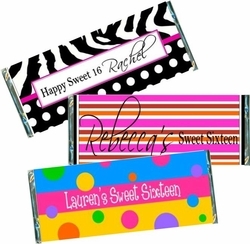 We have the coolest Sweet 16 Candy Bar Favors, and Candy Bar Wrappers ever! Let us help you make your Sweet Sixteen Party a SWEET success. Our candy bars would look great at the place settings on your tables, in a basket on your "Candy Bar" or dessert table, or on their way out as a SWEET treat for the ride home. Sweet 16 Candy bar favors are always a hit! Kids love chocolate, and so do adults. It's the perfect party favor for everyone! Our wrappers are so trendy and festive, and bursting with color! We print our candy bar wrappers on a laser printer. We use high quality glossy paper, to make your candy bars look spectacular! The trendiest parties around use Candy Under Cover for all of their party favor needs. Have a particular design or style in mind that you don't see here? Just email us info@candyundercover.com or call us toll free at 877-235-2828 and one of our designers will work with you to create a custom candy bar wrapper for you. 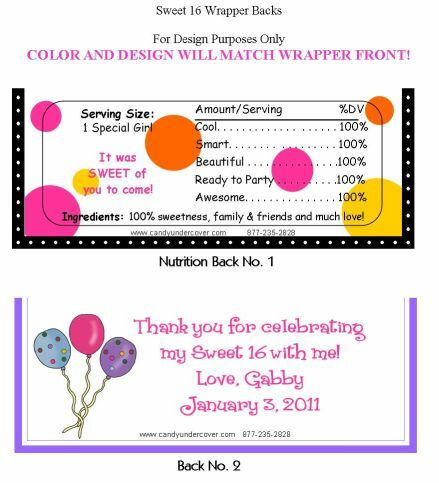 We will customize a one of a kind candy bar wrapper for you FREE! Adding a photo to your wrapper is FREE! 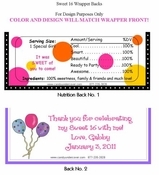 Personalizing your wrapper is FREE! We will email you a proof of your wrapper FREE! Order is easy and stress free! You can order the CANDY BAR WRAPPERS ONLY for a DIY candy bar favor if you are up to the challenge. Or order the WRAPPED CANDY BARS and sit back, relax and let us do the wrapping for you. Either way, you will treat your guests to a delicious chocolate bar covered in a totally awesome chocolate bar wrapper. We can put a photo of your child on any of our wrappers. If you would like to add a "photo", please send photo & order number (once you place your order) to info@candyundercover.com.